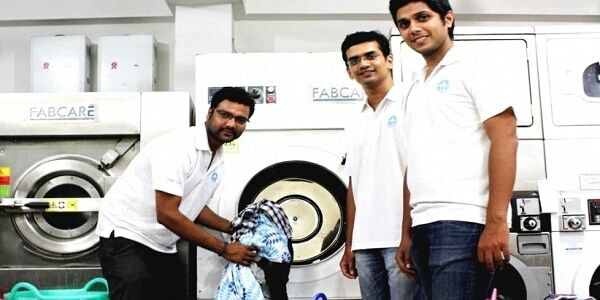 How PickMyLaundry started by three IITians is trying to solve real life problem of the Laundry industry? Pick My Laundry delivers premium washing and dry cleaning service leveraging mobile based technology. It offers home doorstep pick-up of dirty duds and delivers clean and fresh clothes back at your doorstep. The company gives laundry services with antiseptic wash, fabric softener and hygienic detergents. Anyone can schedule a visit to their Live Processing Centre after pre-scheduling a visit with them. Why we chose Pick My Laundry as Startup of the Week? • The company started with no initial business model is now with a well going path for future. • Started with a single vendor at a single location in Vasant Kunj, it has grown to whole South Delhi as well as Gurgaon within a year. • It offers pick-up and drop-off facility at no extra cost. • The platform handles service of 4000 clothes a day. • The company pricing is transparent as full price list is open over the platform. • The customers can book the services and get their laundry picked, washed and delivered within 48 Hours. • Pick My Laundry has all the laundry solution by scheduling a pickup & drop via mobile app/website or through a phone call. 1) How ClearTax becomes India’s number #2 choice in filing Tax returns? Gaurav Agrawal cleared the IIT-JEE exam in his first attempt and chose Metallurgical Engineering by his choice. He graduated in the year 2011 and after that he joined as a Management Trainee in Tata Steel. At Tata Steel, Gaurav worked in a Greenfield project and was looking after the Project Management of Blast Furnace, a unit producing hot-iron at 1600 degree temperature. Gaurav worked there for more than 3 years and was already in a talk with his friend discussing the idea of doing business with his friends Ankur Jain (IIT Bombay) and Samar Sisodia (IIT-BHU). While looking for business opportunities across all segments, the trio found laundry as a big opportunity in India and finally attracted towards the startup culture, in January 2015, the trio left their jobs and started looking for the opportunity in the streets of Delhi. Thus, finally the idea was implemented and the foundation of Pick My Laundry was kept in the late January 2015. The service was started from Vasant Kunj in South Delhi with just one vendor. Soon, the response of people gave them happy moment and soon the three IITians expanded the service in various regions across Delhi-NCR. The company provides its Android App for free download on the Google Play Store. The company handles 4000 clothes in a day which they claim as their biggest achievement so far. Currently PML operates out of offices in South Delhi and Gurgaon, and the company is aiming to expand its operations in major Tier I cities by the end of 2016. PickMyLaundry plans to expand and extend its services to customers worldwide once its India operations are smooth. Since the size was unidentified and the prospect appeared to be much bigger, the company so decided to work on an aggregator model that could serve to the masses faster. During initial period of three months, like all other start-ups, the three founders ended up doing pickups and deliveries themselves! Field work proved to be a lesson and gave them a better understanding of customer requirements, logistical problems associated with the service and also learning techniques in packaging, processing etc.